Indulge yourself – and sing for the love of it! VoiceWorks is the choir for young adults who want to experience the joy of communal singing again, without the pressure of auditioning for, or rehearsing with, a super-serious classical choir. It’s perfect as an outlet for university students who need a pressure release, or just for de-stressing from work, career, and all those other adult life responsibilities! At VoiceWorks, we welcome all singers. You might have been a 10-year-old soloist or a keen chorus member of your high-school musicals, but you will always feel you belong in VoiceWorks. Of course, the singing is important. You’ll be working on three- and four-part harmonies for performances at events and concerts, and you’ll learn how to improve your vocal technique under VoiceWorks’ Musical Director Kate Schirmer, who knows that the easier it is to sing, the more you enjoy it. But foremost, the goal of VoiceWorks is for you to have a great time, meet new people who love singing as much as you do – no square pegs here! – and have a blast performing in front of appreciative audiences. Why is VoiceWorks different to other young adult choirs? Audiences love show choirs because they’re so entertaining. Participants love them because they’re fun to rehearse and perform in. Unlike traditional choirs, show choirs have a broad and eclectic repertoire, that goes way beyond the Bach and Handel classics. So, for Voiceworks, you could be singing anything from a gospel song to a show tune to a medley of rock’n’roll hits from the Joan Jett, Taylor Swift and the Shangri-Las! Of course, with music like that, you can’t stand still. So, you’ll learn movements simple, fun movements that are choreographed for your group. Yes, they’re challenging and quite energetic, but when you master them, you’ll be elated at what you’ve achieved. And when you finally step out on stage with VoiceWorks, you’ll feel like the consummate performer. As a community choir, we welcome all voices, all skill levels – experienced or not. We won’t make you stand in front of the group and sing solo (not unless you want to!). And you’ll be assigned to the voice type that suits your range and where you feel comfortable. Alto? Soprano? Tenor? Bass? No worries! There’s a place for you at VoiceWorks. We also we also train you to become the best singer you can be. Your musical director Kate Schirmer is one of Brisbane’s most-respected and sought-after vocal teachers and will coach you in the best techniques to get the best sound from your ‘instrument’. Once you find it easier to make those sounds, you’ll enjoy your singing so much more. Work, life and study – they’re stressful enough as it is. So, VoiceWorks choir is the opportunity to let your hair down, hang out with great people, and make wonderful music together. And, because everyone loves to sing, the atmosphere at rehearsals is always upbeat, so get ready for a few laughs too! The VoiceWorks singers are a close-knit bunch – new and old friends who often meet for social catch-ups as well as their weekly rehearsals. 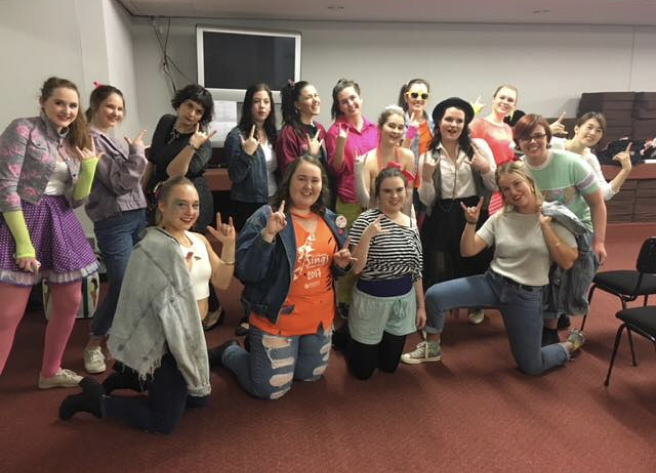 Once you join VoiceWorks, you’re also welcomed into the broader Queensland Show Choir community, which is one of the few organisations in Australia where three generations of a family can sing in the various ensembles. So, when you hit the upper age-limit for VoiceWorks, there’s another adult choir waiting – with more new friends to meet. Queensland Show Choir itself hosts or takes part in concerts, fetes, carols and more – giving you the opportunity to perform regularly in special events such as the Queen Street Mall Christmas Parade and onstage at the annual Brisbane Sings show at the Queensland Performing Arts Complex.